Most of us have experience with the West Street arterial -- a 3+ lane [in each direction] surface road that circumvents downtown to connect I-690 to Onondaga and Adams Streets -- but rarely do we think and acknowledge the fact that it bypasses, at high speeds, much of the neighborhood it passes though. It acts as a divider between the Near West Side and downtown, in arguably as detrimental a way as the I-81 overpass on the east side of downtown. When the roadway was built, it tore through all the buildings in its way, leaving a lot of vacant and undesirable land along its edges. In addition, it was designed to handle a far greater car capacity than it carries today, so not only is the adjacent land underutilized, but the roadway itself is too. Is this arterial even serving its intended purpose, since the interstates already allow motorists to bypass the central business district? What if traffic were to be slowed with the narrowing of driving lanes, the addition of landscaping in the median, the introduction of bike lanes and on-street parking, and more frequent intersections as part of a reconnected street grid? With a relatively modest reconfiguration along these lines, what is now the anti-urban can become a part of the city fabric once again. Sidewalks, stoplights, and crosswalks would allow pedestrians to move along and across West Street, allowing the vibrancy of Armory Square to be connected to and combined with the fledgling Near West Side SALT District. Instead of speeding past, motorists would be enticed to pull into a parking space and join in the new-found level of activity. Land along the corridor would once again be of value to residents and investors, and new developments would begin to fill the gaps caused by decades of disinvestment along the street. Slowly, one of the city's many large wounds would begin to be healed. 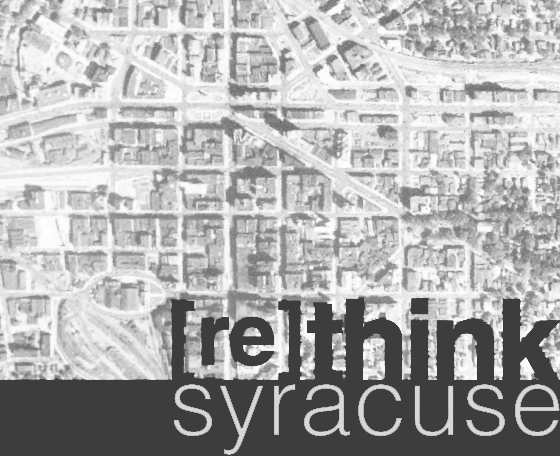 This image was created originally for a recurring piece in Syracuse Magazine called Imagine This.